AUCET 2019 2nd phase Counselling dates,Certificates verification process|AUPGCET 2019: Andhra University has issued Post Graduate Common Entrance Test(PGCET ) 2019 Notification on 22nd February, 2019 and AU is inviting online applications from the candidates who have passed or appearing for the final year examination in the qualifying degree for admission into Post Graduate courses as listed in its website (www.audoa.in) leading to Post-Graduate degree in M.Sc., MA., M.S.W., M.Com., M.H.R.M., M.Ed., M.P.Ed., PGDAS., P.O. Diploma in Yoga., 5 Years Integrated Courses in M.B.A. and Nanotechnology for the Academic Year 2019-2019 offered by Andhra University Campus. 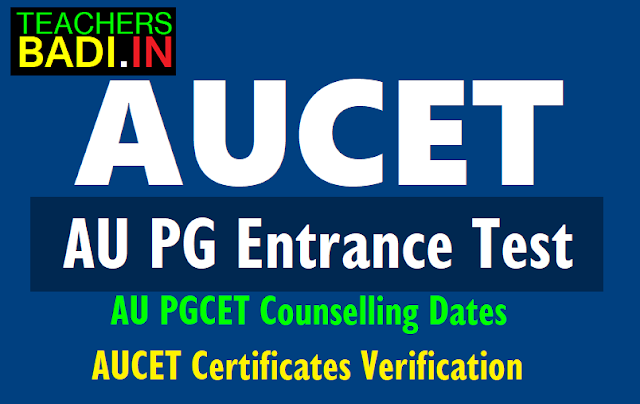 PG Centre, Vizag and its Affiliated Colleges through AUCET-2019. PG Entrance Exam would be conducted as per schedule on ....... May. 2019. After announcement of results/rank cards, counselling dates would be released. So, candidates should attend the certificates verification process with the following certificates. Candidates must be attend to AUCET - 2019 Entrance Test and Counseling are eligible for Fee Reimbursement. 9. For the purpose of reimbursement of fee, the Income certificate is invariably to be issued by M.R.O. If the Original Certificates are not submitted at the time of counseling he / she has to pay total prescribed fee on par with the candidates of other categories and no concession will be allowed by the allotting authority. For admission into various P.G. courses in Sciences, Arts & Commerce, Law offered by Andhra University and its affiliated colleges, Dr.B.R.Ambedkar University, Etcherla, Srikakulam and its affiliated colleges. 6-Year Integrated (B.Tech.+M.Tech.) dual degree programmes offered in A.U. College of Engineering (A) and A.U. College of Engineering for women, the second phase of certificate verification and web counseling will be announced later. Candidates who have completed Certificate Verification in the first phase can directly give the options in the second phase with the same password. They are not required to attend the Helpline centre again. 2 Manual Admissions for NCC and CAP categories at Visakhapatnam (Directorate of Admissions Office) ... May, 2019 9.00 A.M.
3 Manual Admissions for PH and Sports categories at Visakhapatnam (Directorate of Admissions Office) .... May, 2019 9.00 A.M.
4 Manual Admissions for NSS categories at Visakhapatnam (Directorate of Admissions Office) ... May, 2019 9.00 A.M.
5 Certificate verification at four (4) Helpline centers : Visakhapatnam, Srikakulam, Kakinada & Vijayawada ... June, 2019 9.00 A.M.
10 2nd Phase of Certificate verification at four (4) helpline centres ... June, 2019 9.00 A.M.
15 3rd Phase Admissions ... June, 2019 onwards details will be announced. Web Based Counseling: Candidates having AUCET/AUEET -2019 ranks are required to be present on the scheduled date and time at any of the notified helpline centres with all the above certificates and registration fee 500/- ( 250/- for SC/ST/PHC). Admissions for “NO TEST” courses will be conducted manually as per the following schedule. Note : 1) The details of colleges, courses offered, roaster point, vacancy position and fee are available in the websites : www.andhrauniversity.edu.in/doa and www.audoa.in. 2) The Candidates who secured seats must pay the prescribed fee before the deadline, through online, failing which the seat will be cancelled. The payment process is same as that done earlier for Application Registration. cancelled automatically. Candidates are advised to be prepared to loose the already allotted seat when giving new options in the second phase. However the previous allotment will be retained only if a seat is not allotted in the second phase. 4) Those who have already secured a seat in earlier phase of web based counseling and wish to slide to some other college / course will have to pay Rs.300/- as sliding fee if seat is allotted as per the new options. If sliding fee is not paid candidate will loose both the seats.